Shortly after yesterday’s post, I heard of another intriguing opening. It’s been whispered for a good few months but we now have confirmation that craft beer and chicken concept Broood (yes, there are three o’s) is to open on King St/New Walk. The new operators completed on the lease this week for the building that recently housed Sloanes bar and before that Out of the Vaults. Most significantly though, it was home to Vin Quatre (or more commonly Vin IV), one of the first bars that came out of the liberalised licensing regime of the 9os and which has legendary status among a whole generation of Leicester hipsters. It was, famously, hugely busy and massively profitable. There is already a Broood in Hinckley – with eight or nine real ales and craft beers mainly from small regional breweries and a food menu that focuses on piri piri chicken, wings in hot sauce, hot dogs and pies. The Leicester branch – which should open before Christmas – could fill the hole left by the demise of The Pub on New Walk – if it goes a step further and can rival the popularity of Vin IV, then happy days all around. One more thing as I clear the decks before going off on holiday tomorrow – thanks to Miguel Holmodinho for a tip about Merhaba, a new Eritrean café restaurant on Churchgate. It’s obviously first and foremost a venue for exiles but its not intimidating to others and we had a lovely lunch in there this week. Eritrean food is at core stews and vegetables served on injera – a sourdough flatbread with a soft spongy texture. Typically it’s all served on a big platter and eaten communally. We had a lamb stew with fairly fiery berbere spicing and spinach with onion and spices – it was different and delicious. It’s particularly delightful as the sauces soak into the bread. There are plenty more things on the menu that I have little idea about but will go back after a bit more research. Meat dishes are around £6-£8, various vegetable ones around £3-£5. Note the bread is available in gluten-free form made with teff grains. There’s not many reasons to venture down Churchgate nowadays. Lebanese restaurant Cedars and Caribbean takeaway Johnnycakes (of which more in the near future) are two. Now we have another. Country pubs have to bold to survive. It’s not enough to stock the beer and open the doors. – they need to find a strategy that works for them and their staff, for the locals obviously, and for guests who might come in from further afield. For some that might fine dining, and we’ve got a few of those in Leicestershire and Rutland. For others it might be being part of a chain or maybe linking up with caterers to offer Asian food. That offer will need to be reviewed, tweaked or radically changed from time to time as local and national trends dictate. The first time I went to The Queen’s Head in Belton, around a decade ago, it was in the fine dining spectrum. Nowadays, it still a smart, stylish pub but the food has been stripped back to a menu of classics that provide a lower price point and probably have a wider appeal. Some of the dishes might sound like they come from an ironic 70s theme pub, but it’s nothing of the sort. The Queen’s Head remains a classy operation under MD Henry Weldon that offers some classic dishes of recent years done from scratch, with good ingredients and done simply but well. Mind you, as we sat down in the smart dining room to the less than relaxing sound of Black Sabbath’s Paranoid we did wonder if the retro styling had been taken a step too far. Eventually the soundtrack became a bit less frantic but it remained a bit loud for us. 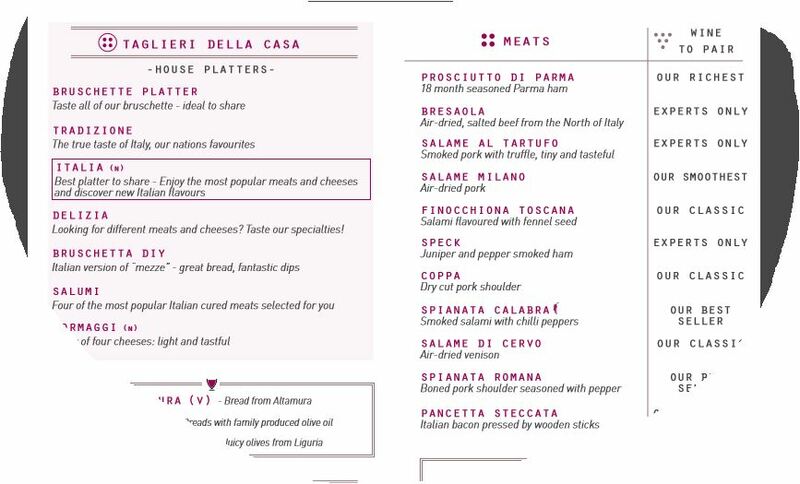 The menu is short and nicely focused. There’s a selection of steaks, cooked over coals on a Berghoff barbecue grill, and classic dishes such as a whole plaice on the bone, beer battered fish and chips and baked camembert. We decided to go with the flow and start with a prawn cocktail and found it very enjoyable. It was not messed around or modernised – simply good, juicy crustaceans in a tangy mayonnaise, crisp lettuce and fine bread. A second starter was a take on a fried breakfast (below) and showed again that simple treatment of good ingredients can be really successful. 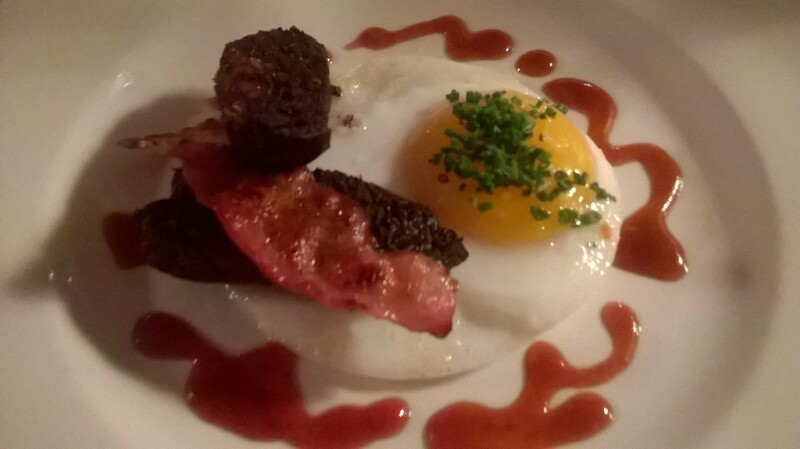 This featured a fried duck egg with a rasher of crispy smoked bacon and some wonderful iron-rich, home-made black pudding, all set off with some delightful sweet and fruity gooseberry ketchup. It wouldn’t have satisfied anyone in search of an early morning full English, but it worked surprisingly well as elegant starter. Being a bloke I ordered the steak and chips, in this case a, 8 oz rib-eye. It was a pretty good – tender, full-flavoured and nicely grilled to medium rare. The fat triple-fried chips were outstanding, superbly crunchy with floury insides they were the perfect antidote for anyone with no time for skinny fries. The little salad of watercress and red onion was excellent too. Our other main continued the retro approach – a beautifully tender chicken kiev, pleasingly oozing plenty of garlic butter which had neither of the common faults of being bitter or just too strong. Served simply with rich, smooth mash and tenderstem broccoli this was food you might reasonably aspire to cook at home but there’s still a pleasure in having it done well by a chef. Deserts could also have passed muster in the 70s. 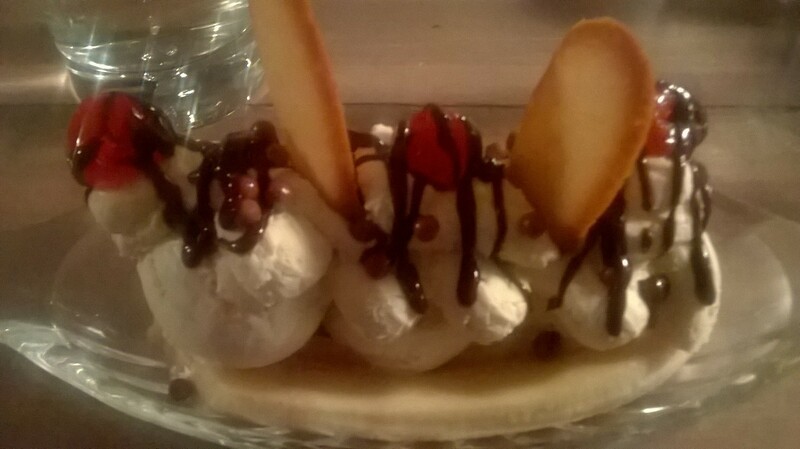 Mine was a nicely done banana split (below) with all elements present and correct including cream, ice-cream, cherries, chocolate sauce, langue-de-chat biscuits. It maybe falls into the guilty pleasure category, but a pleasure it most definitely was. Slightly more sophisticated but equally as far removed from the cutting edge was a sharp, refreshing lemon sorbet with limoncello. There’s a nice family feel about the Queen’s Head. Locals were quietly enjoying a beer or two in the separate bar, while there was a big jolly party in another area of the large dining space having a farewell do for one of the chefs. Obviously there’s a market for people who are looking for good cooking of straightforward, familiar dishes . But there’s also generations who may never have had the pleasure of these dishes and may enjoy them over the latest fad. For all these, a visit to the Queen’s Head should be an enjoyable one.